After 145km of cycling, the last thing anyone wants to do is go and view a variety of accommodations, haggle over prices and then choose somewhere to stay. But we didn’t really have a choice. Tired, dusty and just about ready to punch anyone who looked at me sideways, I deposited bike and baggage with Sam near a big pile of mud and headed into Hampi Bazaar in search of somewhere to lay our heads. It was a mission and I was beginning to feel like Mary and Joseph in search of that mythical inn, everywhere I asked was full and I began to think we’d have to lay our heads down with the cows in the street for company. Eventually I lucked out and we ended up with a basic room, we had a bathroom that we shared with the family that owned the guesthouses as well as a plug socket that threatened to set the building on fire every time we plugged something in. But the owners were kind and friendly and we had a place to recuperate for a couple of days and see the temples. 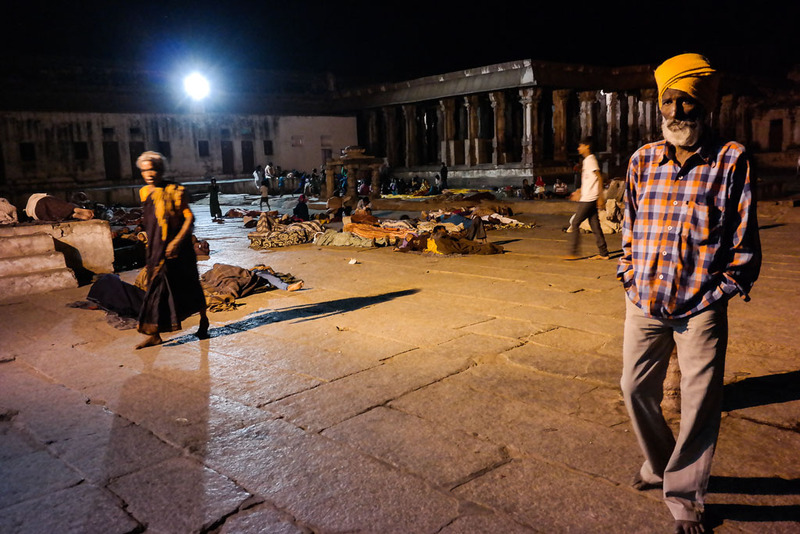 That evening, heading over to the temple in the dark, we expected to find it quiet with a few peope wandering round. But to our surprise, there were people everywhere. Sleeping on every available surface, families huddled in circles chatting and little boys running around playing chase amongst the crowd. As Shiva’s fesstival approaches, pilgrims come to the temple and stay overnight, sleeping in the stoney courtyard outside before going to worship the next day, cows mingle with the crowd unheeded and monkeys watch from the steep sides of the temple walls ready to leap in and usurp any morsels of food that have been unwittingly left unguarded. With tiredness and hunger weighing heavily on us, all that remained for us to do was have a decent dinner and hit the hay and we did exactly that! We woke early, feeling much refreshed and headed off in search of a breakfast, cup of chai and to see the temple in daylight. As we sat at a roadside stall sipping our hot, aromatic chai, Sam exclaimed “Look?! !” And I turned my head in time to see a truck slowly reverse towards the temple with it’s valuable cargo, Lakshmi, the temple elephant. As she dismounted from her vehicle, pilgrims lined up eagerly with coins in hand to have a blessing placed upon them by this auspicious beast. Money passed from hand to trunk and back to hand and Lakshmi dutifully plonked her trunk on the heads of those waiting, often blessing whole families all at once! Needless to say, I got in on the action handing my donation into her waiting trunk and receiving a blessing in return! After a quick turn around the temple, we decided to head across the other side of the river. We would do a little cycling, see what it had to offer and also manage to get to a bank machine, funds were running low and there were no ATMs where we were staying. We headed down to the ferry with our bicycles, negotiating the steep ramps leading to the river bank without much hassle without a full load of gear to hamper our progress and so we hopped on the boat for a short ride across to the other side. Waiting for the boat in the hot midday sun had taken it’s toll and we stopped by the first cafe we saw to have a cool drink before setting off. As we stepped in to the cafe, straight in front of us, sat Paul and Izzy, a couple we had met two months and many, many miles away in Varkala. We ended up foregoing our planned cycle and spent a few hours chatting and they told us about the great place they were staying. 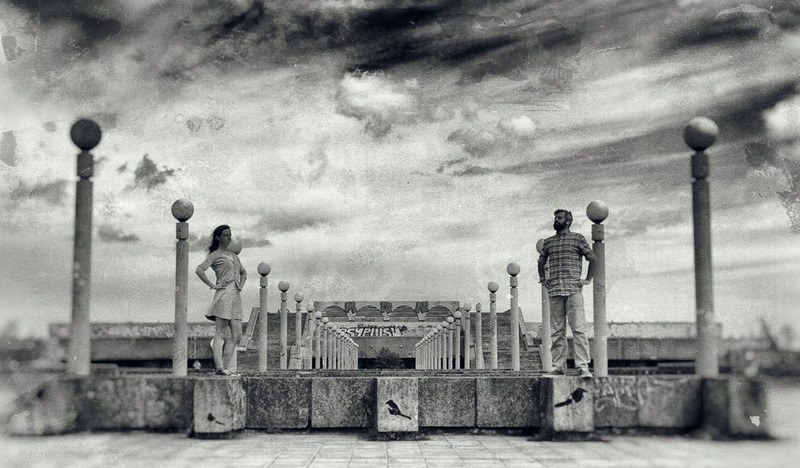 We almost instantly decided that we would abandon the south side of the river the next morning and head over to join our friends at the more picturesque, laid back and clean place we found ourselves now. 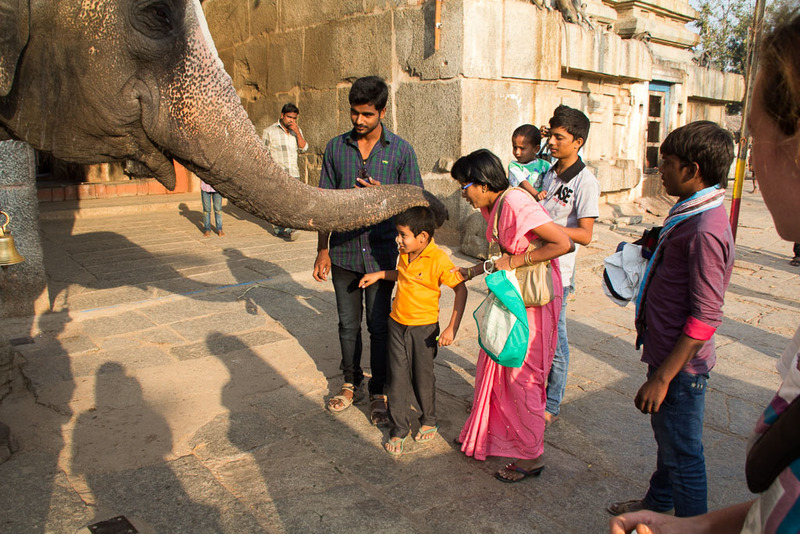 Being blessed by a temple elephant. After replenishing our wallets from the ATM and picking up some supplies at the shop, we ferried ourselves back to our guesthouse and spent the evening watching cricket with our host as India beat Pakistan and getting ourselves ready to leave in the early morning. When suddenly disaster struck, a tuktuk driver had run over our hosts little puppy and they were devestated, with the lady of the house in floods of tears over the little pet that she had raised from when it was a week old, orphaned and unable to feed itself. Unfortunately, we weren’t surprised; the drivers tear around these streets that are no wider than a cow at speeds that would have you think they are auditioning for a part in the Fast and the Furious. 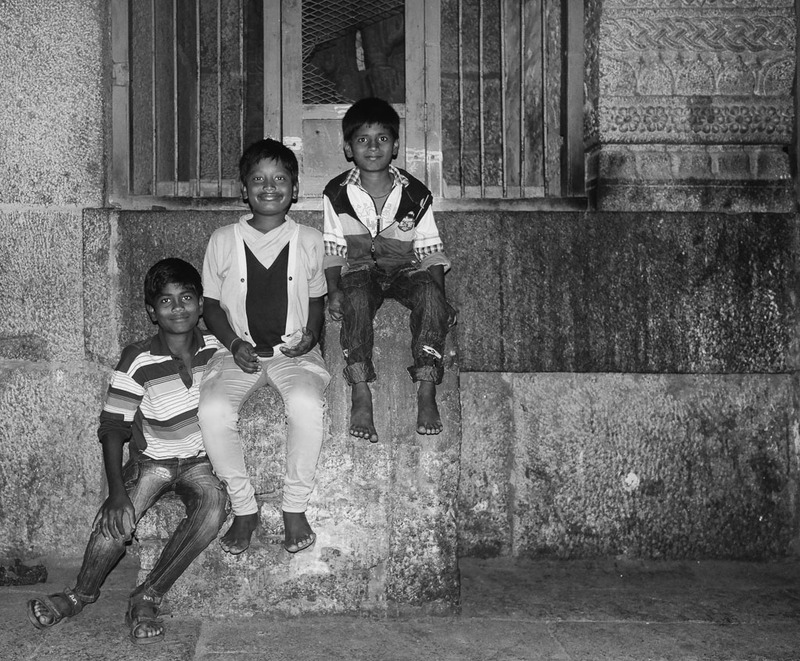 When we left in the early morning, we waved goodbye to the family as the man of the house assured me that Ireland had beaten the West Indies in the wee hours of the morning and we headed off to the ferry, this time fully loaded to begin part 2 of our Hampi visit. Despite the fear that our heavily weighted cargo would sink the boat, we made it across in one piece and in the building heat, made our way to Arba Mystika, the little guesthouse that was to become our home for the next few days. Radhe runs the place, a smiling young man who’s grinning answer to any question you may have is “Why not!?”. We quickly settled in to a slow, relaxed pace, reclining under a bamboo sun shelter on cushions in the sweltering heat. 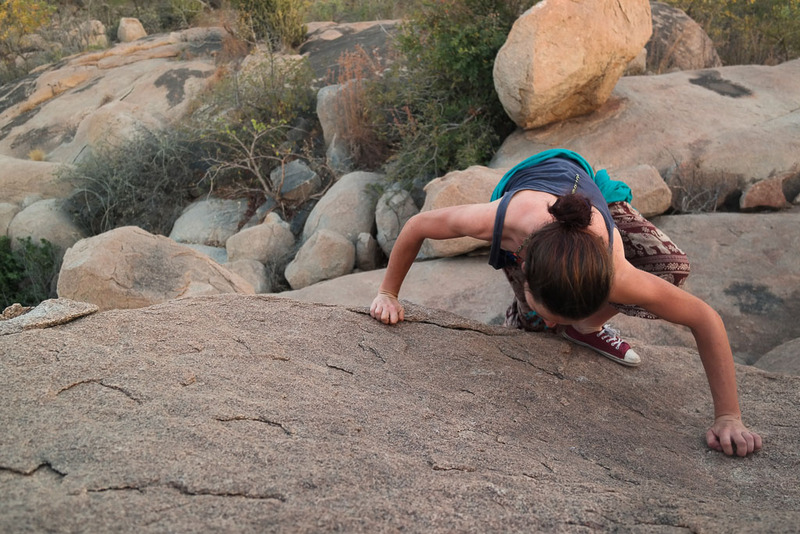 We spent our time exploring the boulder strewn landscape, looking for caves, swimming in lakes and waterfalls and catching sunsets and sunrises from the best vantage points we could find. Time in between was spent hanging out with a great group of people staying at the same place as us, talking about travels and playing Yahtzee and card games and generally having a good laugh. A mixture of beautiful landscapes, peaceful pace of life and good company made Hampi top of the list for places we have visited in India for me so far, and I even managed to ride a small motorbike with Sam as my passenger! The next few days passed easily, our little 50cc motorbike transporting us to the waterfals to cool ourselves down in the midday heat, evenings spent listening to music interspersed with cups of fragrantly spiced tea whenever Radhe decided that it was “Chai Time”! 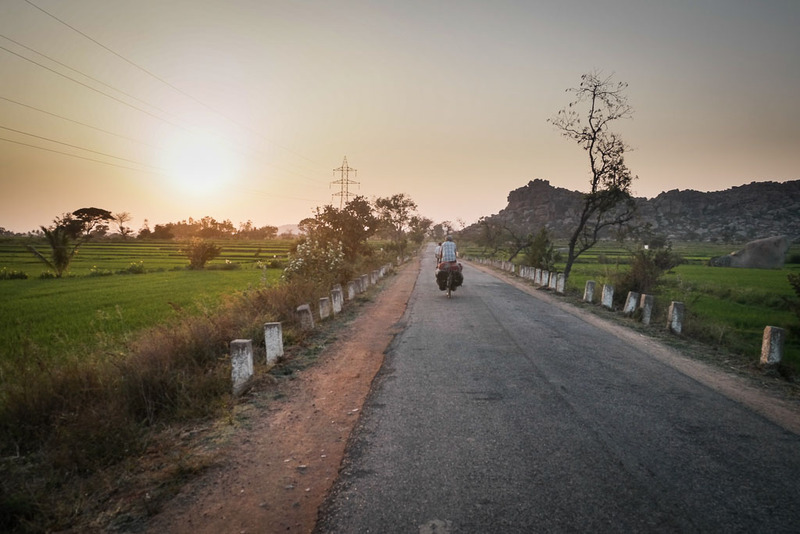 Our plans to cycle the last stretch to Hyderabad evaporated in the laze-inducing, oppressive midday sun and we soon decided that we would be taking a bus for our final leg in the south. With our bus booked, we were ready to go until the man from the travel agency arrived at our guesthouse bearing the bad news that our overnight bus would be cancelled, it had been involved in an accident (!!!) and we would have to wait until the next day to travel. When it came to time to finally leave, we pedalled off towards the sunset at 5:30, planning to make it to Hospet, where our bus would leave from well before our departure time of 11pm. With a pleasant cycle through the beautiful landscape in the fading twilight, we made it to Hospet with plenty of time to have dinner and relax before we boarded for Hyderabad. 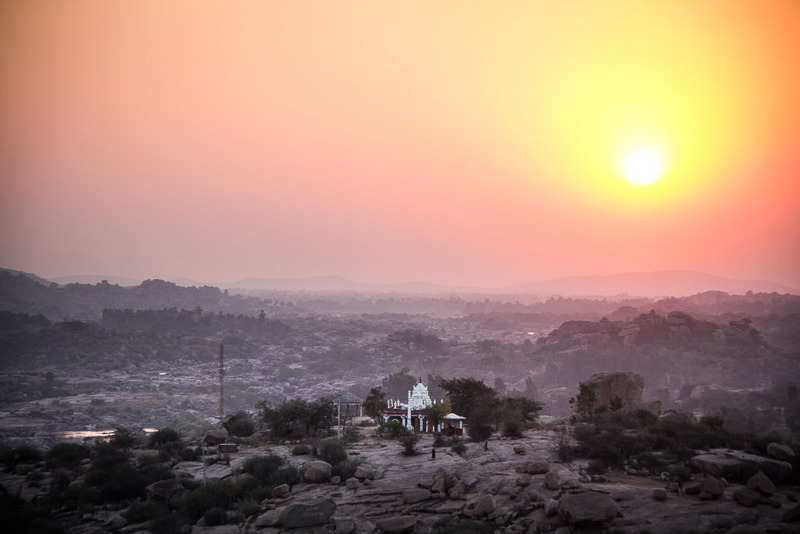 And so, our idyllic time in Hampi came to an end. Suitably elaxed and invigorated, we were ready to face a big city again, hello Hyderabad! Sheena could barely ride her bike when we started…. now she high fives kids as we cycle along! Enjoying the cooler evening temperatures. I wish we would have stayed longer! Great read and fantastic photos! All the best!